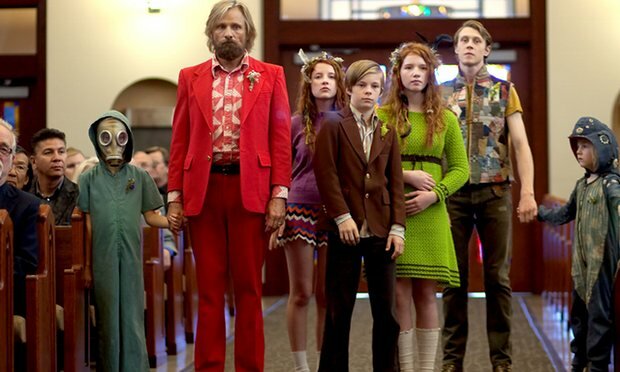 It’s difficult to imagine anyone other than Viggo Mortensen in the role of Ben in Matt Ross’ Captain Fantastic. That may be because it’s not so difficult to imagine Mortensen himself behaving in a similar fashion outside of that role. The actor reportedly speaks fluent English, Spanish, Danish, and French. He also speaks reasonably adept Swedish and Norwegian. He writes poetry, is a jazz musician and painted the murals that his artist character paints in A Perfect Murder. He’s even an accomplished horseman. This is a man with a will to live and urge to experience. More importantly, the actor has made a habit of taking on roles that combine idiosyncratic and extreme behaviour with a charisma and charm. That’s Ben in Captain Fantastic. The film may not have worked without Mortensen and there may be no other actor that could have instilled in Ben such a sense of legitimacy. 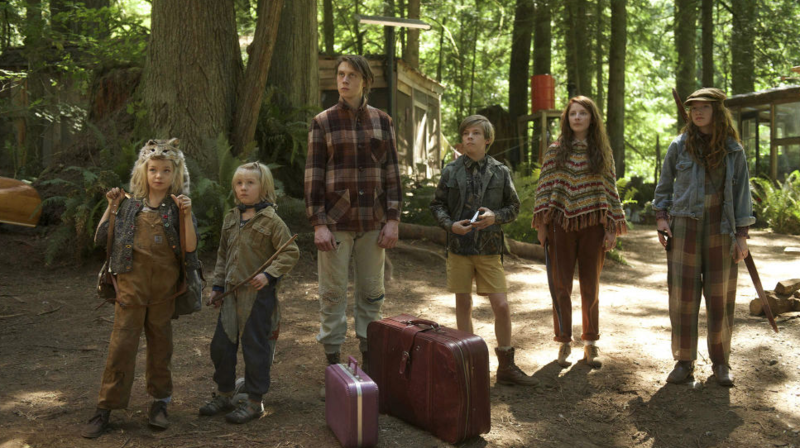 Off the societal grid and in a forest somewhere in the Pacific Northwest, Ben is raising his six children by himself. They are hyper-intelligent, each speaking multiple languages and engaging in schoolwork well beyond their years. They are also as fit as professional athletes, with the skills to survive in the wild. In the opening scene, one of Ben’s son tackles a deer, slicing its throat with a knife. Their mother is in hospital with Bipolar Disorder. Ben gets the news that she has killed herself. Her father, Jack (Frank Langella), warns them to stay away from the funeral, blaming his daughter’s death on the unusual choice of lifestyle. Ben ignores the warning, and sets off with his children to prevent his wife, a Buddhist, from receiving the burial that her father intends for her. Mortensen is a wonderful actor; the sort that is more often than not the best thing about any project that he is involved in. As Ben, Mortensen adds depth to a film that may not have otherwise had much and grounds a scenario that may have otherwise been entirely farfetched. Superficially, Captain Fantastic has a lot in common with the variety of film that has somehow become inextricably linked with the Sundance Film Festival. Quirkiness is their method and affirming individualism is their motive. Little Miss Sunshine is the apotheosis of this sort of film. Whether lumping this Sundance-inclined variety of film into a vague category is reasonable or not, Captain Fantastic is comprised of a lot of the traits that these films are generally, and sometimes unfairly, known for. Crucially however, Ross isn’t entirely on Ben’s side. There is a lot right about Ben’s parenting- some of it veering on the improbable, such as Ben’s oldest son, Bodevan (George MacKay), being admitted to every Ivy League college under the sun – but there’s also a lot about the manner in which he raises his children that is dangerous and absolutely mad. Another film might have portrayed Langella’s Jack as a villain. Captain Fantastic understands his point of view. Ben may be more engaging and charismatic than Jack, but it’s difficult to empathise with many of the actions he makes throughout the film. Individuality ought to be lauded and conformity can be toxic. Ross knows that. He also knows that excessive practices in either direction can be problematic. A lesser film may have turned a blind eye to the inherent flaws in Ben’s system, in the name of entertainment and appeal. For a film that ostensibly celebrates individualism and denounces conventionality, Captain Fantastic ultimately unfolds very conventionally. Ross is an adept director, but his slick technique and the direction he steers the narrative promotes a conclusion that adheres to expectations, when a more unorthodox orientation may have more suited the film’s subject matter and themes. The conclusion doesn’t provide a reasonable continuation of everything that comes before it. Captain Fantastic wants to convey that nothing in life is simple, but isn’t bold enough to be a complicated film.